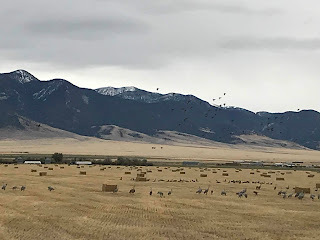 It's finally grain harvest time, which is exciting because it means that the field next to my house will soon be full of birds--Canadian Geese, Mallards and Sand Hill Cranes. 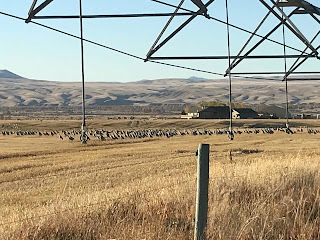 They arrive in droves (perhaps flocks is a better word) to eat the grain that falls to the ground during harvest, and I get to watch them from my deck. View from my front deck . 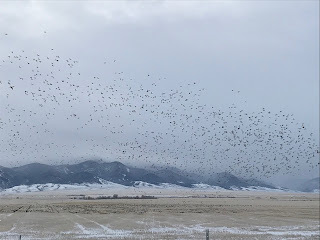 It's difficult to get the scope of the sheer number of birds that will live in the field for the next month and a half, but I would say on average there were several hundred birds in the field every day, and as they gathered to migrate, it wasn't unusual to see several thousand. The cranes are large birds. I've mistaken then for deer at a distance. They arrive here in April, hatch their young, then feed on grain before migrating to their wintering grounds. Cranes tend to stick to their own kind while in the field, while geese and ducks will intermingle. A flock of cranes standing in front of my house. The geese sometimes winter over, but they leave the field for the rivers in November. The ducks are so funny looking as they waddle through the fields looking for grain. They arrive at the fields in huge flocks. This is a flock of ducks circling before they land. There are several hundred ducks already on the ground below them. And the noise...I love the noise, but it's amazing how loud they are. The clip below will give you an idea of what my yard sounds like during the fall. I hope my camera work doesn't make you dizzy. Do you have any unusual fall happenings in your neck of the woods? We have a small wetland along the trail where I walk, and the cacophony the birds make in the fall is amazing. You can't really see them, but the grasses are in constant movement. It's amazing. What a great post this is! 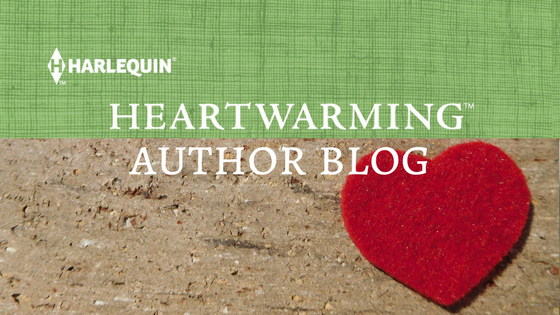 Lovely post--your field sounds glorious. Just yesterday, the sky over me here in Green Bay was filled with the geese and they announced themselves, of course. Doesn't it seem like time stops when we're all looking up to watch? Thanks. 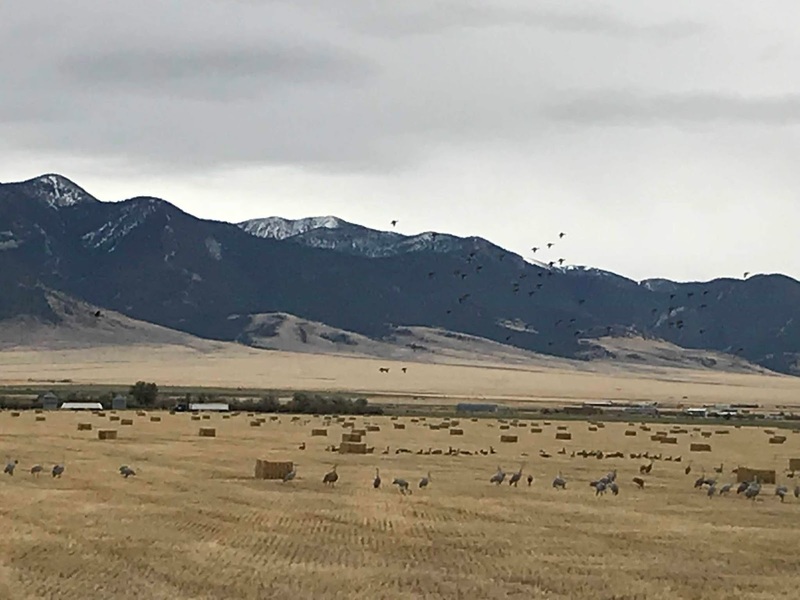 I would love to see those great flocks of birds on your land in real life, Jeannie, but this post is the next best thing! We get flocks of Canada geese during migration seasons here in Ontario, and also tundra swans in early spring in some places. But would love to see cranes. Those autumn sights really say winter is on its way, don’t they? How great that you get to see so many of the larger birds. Here we see migrations of smaller birds throughout the fall. Not enough water to attract the cranes and geese I guess. I used to love to see the sandhill cranes in West Texas when I was growing up. They were probably your cranes, because we'd see them a little later passing through on their way South. In Alaska, it's fun to see how fast the fuzzy gooslings grow up and start practicing their Vee's flying around town before they migrate. Lots of honking when they land on the lake. I figure it's the parents yelling, "Slow down. Watch to your left. Now cup your wings and land..."
Loved this post. We don't get much of anything except an occasional flight of geese going south. There's a bird sanctuary near where I live, but I've never seen it heavily populated. I have visited the Bosque Del Apache Wildlife Sanctuary in New Mexico during the winter. I saw eagles, a blue heron, Sandhill cranes and huge flocks of some other kinds of birds. The noise was wonderful. You have the most incredible life! I love reading about it. Can I come visit soon? Okay, just kidding. Not. But really, I would love watching all these birds. Awesome! I would love to see this. I could watch birds all day. We have a huge variety of species around here, but not in these huge flocks. Wow! What an awesome place your deck must be for bird watching. Gorgeous scenery to boot, what a back drop. 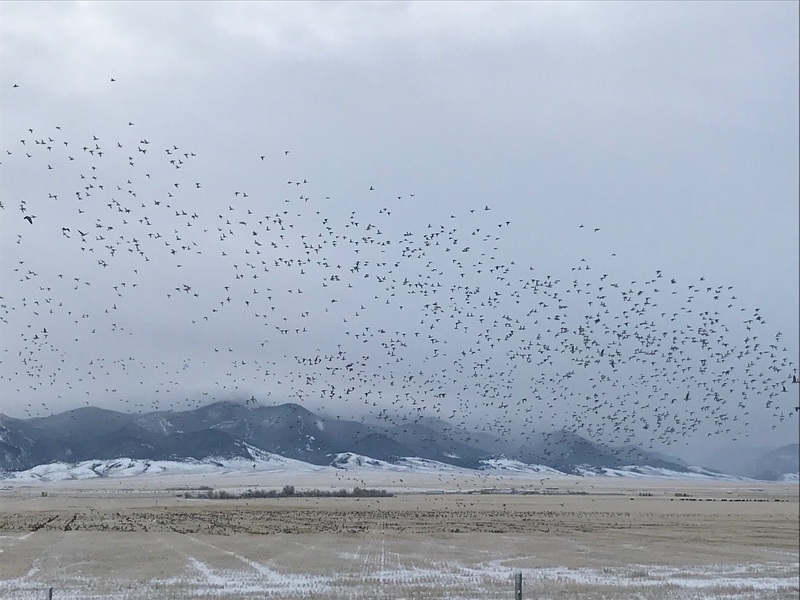 Being able to watch the migratory flocks coming and going in spring and fall must be truly amazing, and you get to learn so much about flock behavior. Thanks for sharing.